Amphiumas are large, aquatic, eel-like salamanders (up to 1 m), with 4 highly reduced limbs, native to eastern North America. 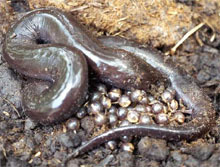 Females guard their eggs, which are laid on land but hatch as short-lived aquatic larvae. Tail is laterally compressed and makes up one third of the total body length. These are paedamorphic salamanders, retaining the larval features of no eyelids or tongue, open spiracle, a lateral line system, and four internal gill arches which aid them in their completely aquatic and nocturnal lifestyle. When their body of water goes dry, they are able to bury themselves in the mud and form a mucous cocoon that keeps them moist until water becomes plentiful again allowing them to emerge. They can go up to three years without food and have been known to live up to 27 years. Its sister group is likely the Plethodontidae. Other morphological characters of the adults include: 1) premaxillae fused; 2) pterygoid reduced; 3) limbs and toes reduced (3, 2, or 1 toe per foot, which is a species-specific character); 4) has lungs; 5) costal grooves. Shen, X., D. Liang, Y. Feng, M. Chen, and P. Zhang. 2013. A versatile and highly efficient toolkit including 102 nuclear markers for vertebrate phylogenomics, tested by resolving the higher level relationships of the Caudata. Molecular Biology and Evolution 30: 2235–2248.